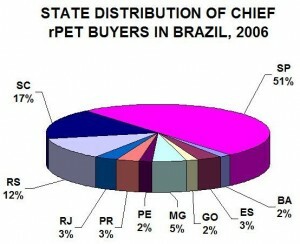 In 2006 Brazil recycled 180 kilotons (Kt), representing about 51.3% of the PET sold in the country during that year. 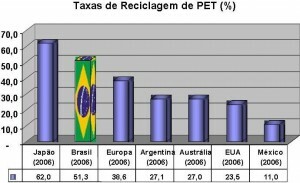 This means that Brazil recycles at double the rate that the US does, and nearly double that of Australia. If you don’t follow plastics, packaging or recycling closely, and you didn’t read The Temas Blog in its early months, then you probably are. 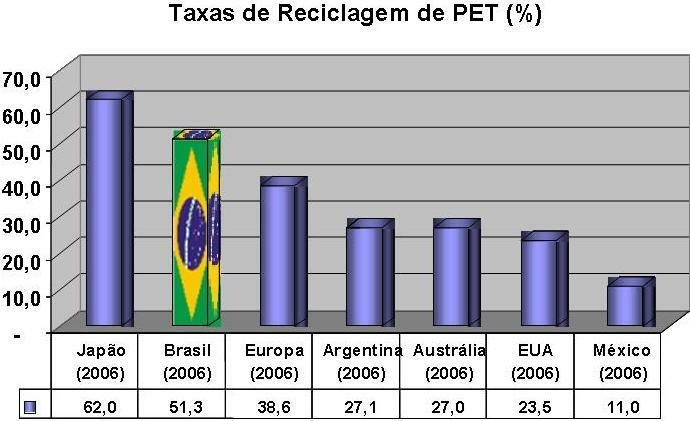 I’m guessing there are even some people in those fields who would be surprised to find that Brazil surpasses Europe in recycling any resin. Eleven years ago, as I prepared the first edition of my book on waste and recycling in Latin America and the Caribbean (LAC), I noted the rapid rise of PET consumption in Brazil, the much slower rise in the PET recycling rate, and proposals in the Brazilian Congress and Rio de Janeiro state assembly regarding PET packaging. I warned that unless the industry worked hard to achieve high recycling rates without legal mandates to do so, they would see many plastic packaging waste bills become law — in the states at least, and maybe at the federal level too. While market conditions surely helped, after many years of talking to both the industry and its critics (some of whom are no longer critics), I know that some of it also is due to some very hard work by some in the industry. A look at the Third Census of PET Recycling in Brazil (Portuguese only) released by the Brazilian Association of the PET Industry (Abipet) shows how far they’ve come. Most of the graphics here are taken from that presentation with the permission of Abipet. This bar graph (click to enlarge) shows the gross tonnage of post-consumer PET recycled in 2004, 2005 and 2006. Tonnage recycled had rapid growth at the turn of the century, but in recent years has settled into a slow-but-steady growth pattern. Installed capacity in Brazil for PET recycling has increased only modestly in 2007, up to 249 Kt from 242 Kt in 2006. in 2006 only 71.6% of this installed capacity was utilized. 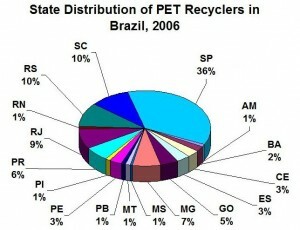 This pie graph (click to enlarge) shows in which states the PET recyclers are located. The acronyms for the states are: AM = Amazonas, BA = Bahia, CE = Ceará, ES = Espírito Santo, GO = Goiás, MG = Minas Gerais, MS = Mato Grosso do Sul, MT = Mato Grosso, PB = Paraíba, PE = Pernambuco, PR = Paraná, PI = Piauí, RJ = Rio de Janeiro, RN = Rio Grande do Norte, RS = Rio Grande do Sul, SC = Santa Catarina, SP = São Paulo. As this makes clear, SP still claims just over a third of the PET recyclers (not really surprising, given that SP remains the industrial heart of Brazil and the country’s principal packaging pole), and its three Southern neighbors (SC, RS, PR) together account for another 26%, but slowly the industry is becoming more spread out across the nation. 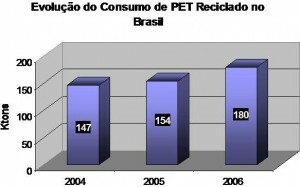 This bar graph (click to enlarge) shows that the volume of rPET consumption in Brazil rose 17% between 2005 and 2006, and that, once final figures are in for 2007, they are expected to show demand growth as well. What Happens to the Recycled PET? In what form do buyers purchase rPET? In volume terms in 2006 91% bought flake, 9% polymer. Where is the rPET going (where are the main buyers located)? This pie graph (click to enlarge) breaks it down by state by number of firms that are steady buyers of rPET. SP is dominant with half the firms. Notable is the swift rise of ES, which in 2004 was under 5% and in 2005 rose to 15.2%. 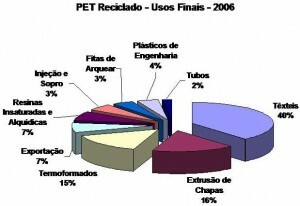 The pie graph at below right (click to enlarge) shows the various uses of rPET during 2006. The largest use category, as it is in the US and Europe, is textiles at 40% (vs. 44.4% in Europe), down slightly from 43% in 2005. Of this category, 62% involves fibers, 7% cords, and 22% monofilament. The second and third largest use categories in 2006 are plate extrusion (16%) and thermo-forms (15%,, up from 11% in 2005). Dropping in the their share of final use were chemical resins (from 16% down to 7%), exports (from 12% to 7%), and tubes (from 6% to 2%). And what about future rPET consumption? Half of the current users polled indicate that they intend to increase their purchase of rPET, one-third hold their use at current levels, and 17% indicated intent to diminish their consumption. Take a closer look at that first bar graph at the beginning of this article, and note who is in fourth place. Yes, Brazil’s neighbor, Argentina. 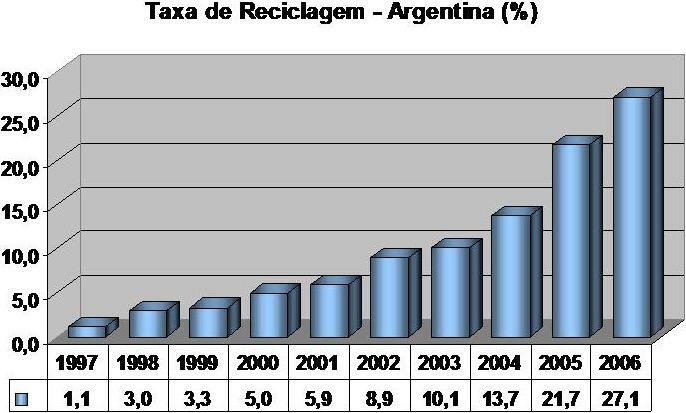 PET recycling has been accelerating in Argentina, both in terms of tonnage and recycling rates (click on the following bar graphs to see larger versions). 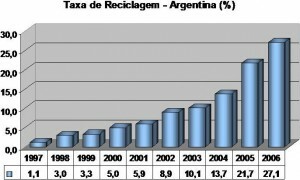 Interesting to me is how Argentina’s tonnage of recovered PET kept growing even during that country’s economic crisis. How long before their recycling rates match Europe’s? The other LAC nation noted in that first bar graph is Mexico. 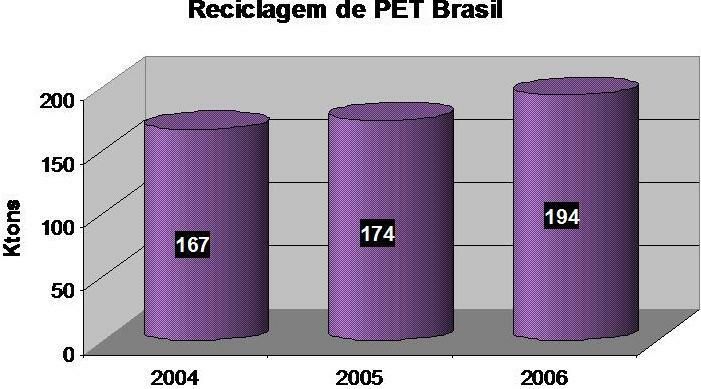 So far its “recycling” rate for PET is modest at 11%, in part because consumption is growing so rapidly (735 kilotons in 2006) and recovery and recycling has not kept pace. Are you wondering why I put quotation marks around recycling? Because 80% of the PET collected in Mexico is exported, and to me, that is not necessarily recycling. Why isn’t Mexico’s recovery rate for PET higher? I’ll be taking a closer look at that question in an upcoming post. 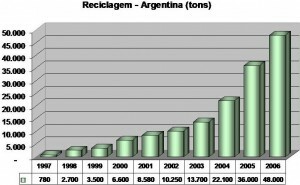 Do you keep records of Plastic Recycling in coutnries other than Brazil and Argentina? Very informal networks in other countries, according to people in these countries. Welcome to The Temas Blog. I’m surprised, I would have thought an outfit like SRI would already have such data. 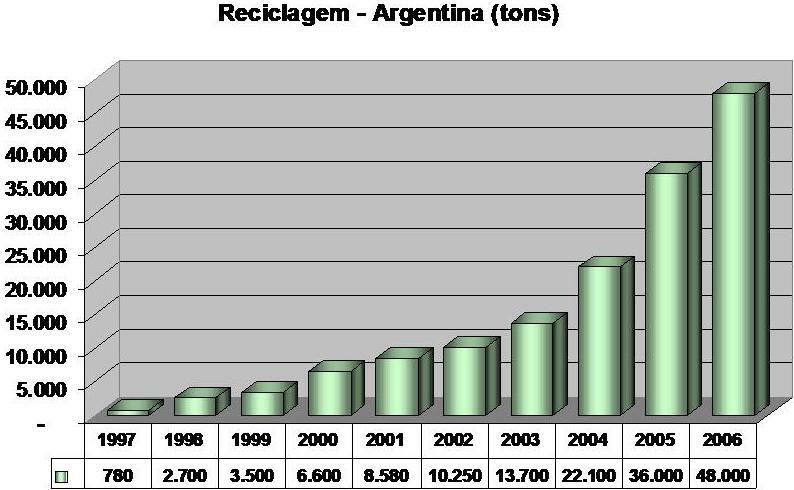 There is some data on plastics recycling in other LAC nations, but the question is how reliable and up-to-date such data is outside of Argentina, Brazil, Mexico and Uruguay and perhaps Chile. Does SRI wish to contract me to hunt down data? 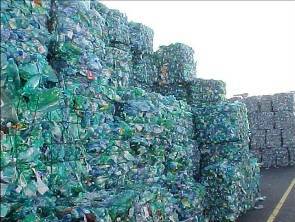 Actually, recycling networks in Brazil — beyond collection — is becoming more formalized every day. However, apart from a few waste streams (PET, aluminum), it remains quite informal in the other nations in the region.